Want to quickly remove unwanted beginning and/or end of a video before sharing with friends or published to social networking sites such as Facebook, Instagram, Twitter, YouTube and others? Or want to trim the video to show just the highlights before sending to family and friends? 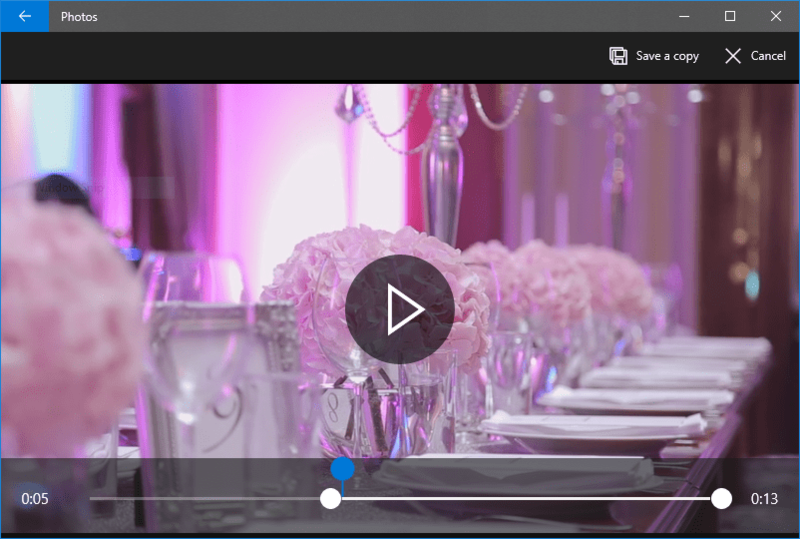 In Windows 10, the Photos app (yes, the Photos app) has a function that can trim video. 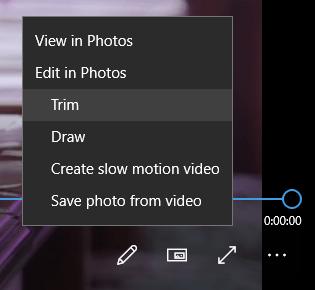 In fact, the Windows 10 built-in Photos app has several more features that supports video in addition to trimming tool, such as drawing on video, creating slow motion video, and saving photo from the video. With Photos’ built-in video editing functions, it provides a free, easy and fast way to trim the videos, without having to download and install any third party video editing program or application, which usually harder to learn and not easy to use. Open the video that you want to edit with Photos app by right clicking on the video, and then select Open with -> Photos in the contextual menu. If you have already imported the video into Photos app or the video is located in one of the source folders, you can browse and select the video directly in Photos app too. Click or tap on the playback video once to display the menu bar on the top of the window. Click or tap on Edit & Create and then Trim. Alternatively, open the video clip in Films and TV app for playback, and click or tap on Edit in Photos icon on the bottom right corner, and then select Trim. The two small white circles on the video timeline reflect the starting and ending markers for the video clip. Adjust the small white circles to the position where you want the video to start and end in order to trim the unwanted parts. When adjustment is made, a tooltip appears above the marker to show the remaining video length. The blue marker reflect the current playback location on the video, where you can adjust to see if all parts of the video that you want are included. When done, click or tap on Save a copy with floppy disk icon on the top menu bar. Photos app will save the trimmed video as another video with “Trim” appended to the end of the original file name, leaving original video untouched.